SurvivorNZ: Thailand (2018) - 11th place, 8th out. Voted out in Episode 7 (Day 21). NZ: Thailand Ep. 1 RC: Manages to avoid actually participating; Khang Khaw wins. NZ: Thailand Ep. 1 IC: With Lisa, works the puzzle, and Khang Khaw wins again. NZ: Thailand Ep. 2 RC: "Smash & Grab" - Unlocks the box containing the ball; Khang Khaw wins melons. NZ: Thailand Ep. 2 IC: "Shoulder the Load" - One of the Khang Khaw loaders; Khang Khaw wins, 3-0. NZ: Thailand Ep. 3 RC: "Idol Hands" - Loses to Arun, and Khang Khaw loses, 10-3. NZ: Thailand Ep. 3 IC: "Deep In Thought" - Sits out, as Khang Khaw wins big. NZ: Thailand Ep. 4 RC: "Sumo at Sea" - Goes 0-3, losing to Arun and Liam (twice), but Khang Khaw wins, 10-5. NZ: Thailand Ep. 4 IC: (Chains, bolos) - Sits out, as Khang Khaw throws the challenge, loses. NZ: Thailand Ep. 5 RC: "Dizness as Usual" - Now with Chani, helps move the boards along, but Chani loses. NZ: Thailand Ep. 5 IC: "Buoy oh Buoy" - Works the vertical puzzle for Chani, and Chani wins. NZ: Thailand Ep. 6 RC: (Bridge & slide puzzles) - Works the bridge and slide puzzles with Dave; Chani wins. NZ: Thailand Ep. 7 RC: "Kicking and Screaming" - Not yet participating when Chani forfeits/concedes. NZ: Thailand Ep. 7 IC: (Obstacles, math puzzle) - Helps carry and works the math puzzle, but Chani loses. NZ: Thailand, Ep. 6: Josh Hickford (voted out, 4-3). NZ: Thailand, Ep. 4: Two votes, from Lisa and Tara. NZ: Thailand, Ep. 6: Two votes, from Adam and Matt. NZ: Thailand, Ep. 7: Five votes, from Adam, Arun, Dave, Matt, and Renee (voted out, 5-1). Renee is back from Outpost with a tarp! Stuff.co.nz (4/12/18): "How super-fan Dylan Conrad plans to fool his competitors"
"Dylan is the ultimate Survivor super-fan. He co-hosted a dedicated Survivor New Zealand podcast for the first season. Before Survivor came to New Zealand last year, he even applied for US residency to try and get on the American version! How would your friends describe you? I’m the realist; if you need an honest opinion about anything, you come to me. I’m not afraid to deliver hard truths but I know how to have a laugh. I think they’d also say that I’m the kind of person who really doesn’t care what the world thinks of me. I’m unapologetically me, and I think that’s why my friends like me. Most importantly, I think they’d say I have their backs, if I hear someone talking trash about my friends I’m going to say something about it! 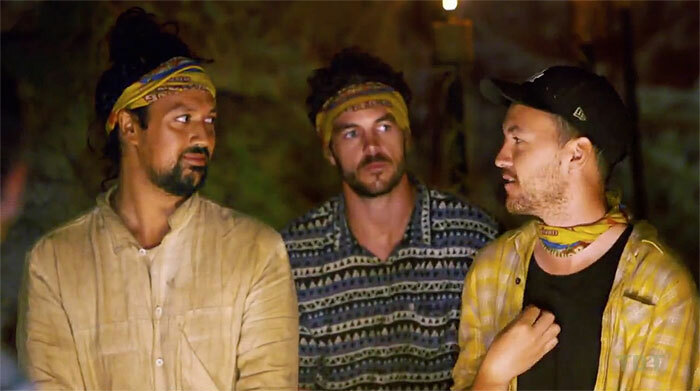 What was the first thing you did when you found out you were to be one of the castaways on Survivor New Zealand? I cried, like, a lot! Then I called my mum and got pizza for dinner. It was a truly surreal moment in my life, one that I’ll never forget. I’ve watched this show since the very beginning and the earliest season that I remembered was the Thailand one. So, this all just felt like it was meant to be! What did you do to prepare for Survivor? I listened to a lot of podcasts, deep dives and exit interviews with contestants. My strongest muscle is my brain, so I focused on that. I downloaded puzzles apps, studied how different puzzles worked and completed them daily on my way to work. What makes you the ideal teammate? I don’t take myself too seriously; I’m happy being laughed with or at. I think that’s needed in a game like Survivor. Someone has to keep the air light, and it usually means people don’t see you as too much of a threat! Besides that, I’m fiercely loyal. Like Sandra Diaz-Twine has always said ‘If I tell you I got your back, I got your back’."